3 Lane Bungee Basketball Game Rentals by Talk of the Town, Rockville, MD - players, harnessed to a bungee cord, try to run down the lane as far as they can to shoot a basketball into the basket. Three (3) people can play at a time, allowing for a lot of action! 3 Lane Bungee Basketball - Similar to our popular Bungee Run game, 3 players, harnessed to an elastic bungee cord, try to run down their lanes and get as close as they can to the basketball goal in front of them. The closer they get, the easier it is to make a basket. But they must be careful, because the further they run, the more resistance the bungee cord will present. Great for a friendly competition at any Company Picnic, Team Building Event, High School After Prom, or College / University event. 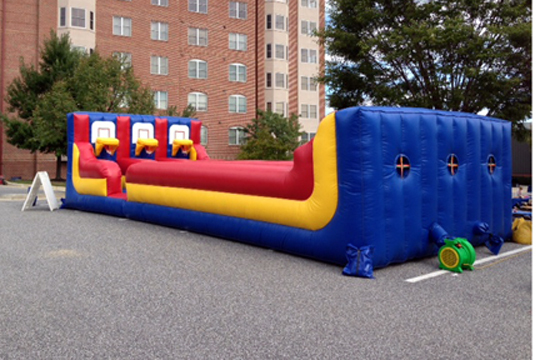 Includes: inflatable, 2 blowers, harnesses, bungee cords, mini basketballs, and1 attendant. Great for ages 8 and up.